Mayor of Bologna Flavio Delbono announced Tuesday that the city will be reopening one of the canals in the historic center of the city. The canal system, built between the 12th and 16th centuries to accommodate the ever-increasing transportation needs of the city with the oldest university in Europe (founded in 1088), was paved over by roads and parking lots in the post-war boom of the 1950s. You can still catch a glimpse of bits and bobs of the old canals, but they’d long since been superseded by cars. Now choked by smog and perpetually overshadowed as a tourist attraction by its more famous neighbors Milan, Florence and Venice, Bologna is looking to beautify and reinvigorate the historic center. A parking lot and part of the road would be torn up between Via Riva Reno and Via Galliera, revealing not only the water underneath but also the remains of an Ancient Roman bridge. The two banks of the canal would be connected by a footbridge, while cars would have the use of one side of the waterway. While Bologna is unlikely to ever rival Venice, said Delbono, more waterways will be uncovered if this first stage goes well, and Bologna could eventually join the ranks of Europe’s major rediscovered ”canal cities”, such as Strasbourg, Bruges and Birmingham. He said the waterways would not only make the historic centre more pleasant for Bolognesi, they would also boost tourism and could even be used for commercial activities. No start date was announced, but this initital phase should take about 18 months. If it’s successful, other canals might follow. That’s a big if, though, because like every old city in Europe, car traffic is a major issue so the loss of street and parking space could turn out to be more of a city planning headache than the canals are an advantage. If it does work out, there are 5 main canals still running underneath of the streets of Bologna which could be revealed one at a time. The Navile had its own port and linked Bologna to the major thoroughfare of the Po river. The Reno and the Savena brought water to the city and the other canals. The Cavaticcio and Moline powered grain and silk mills. Bologna was famed for its silk industry, considered the height of European silk production technology from the 15th century to the 18th. 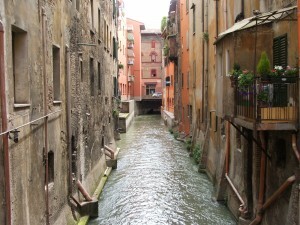 You can actually tour these underground canals now, as well as some tunnels from Bologna’s rich Roman and Etruscan past. Bologna has been a major city since it was called Felsina under the Etruscans in the 6th century B.C. Bologna is also famously progressive. It was the first city in Europe to abolish serfdom in 1256, and it was the only Italian city in the 15th century that allowed women to practice any profession, some could even get a degree from the university. This entry was posted on Wednesday, January 6th, 2010 at 11:39 PM	and is filed under Medieval, Modern(ish), Renaissance. You can follow any responses to this entry through the RSS 2.0 feed. You can skip to the end and leave a response. Pinging is currently not allowed. To tell you the truth, I haven’t had any information about Bologna’s canals before. Hm, interesting. I will go to see. I didn’t know about them either. I’d love to visit the ones still underground as well as see the newly uncovered one when it happens. I have to say, this is a truly needed thing. Bologna is one of the least appealing places I’ve ever been to. It reminds me of Los Angeles without the money, heat, or fancy houses. Whoa. That’s really saying something. It can’t be that bad, surely? I understand the old ghetto has maintained its medieval charm. Perhaps we just failed to stumble onto the charming parts, but it was a strangely lifeless city where we were at least. actually the canals are open and there is also a performans of Dante’s Inferno in there. That is truly the coolest thing I’ve ever seen. The fellow in the Dante costume looks just like him! They appear to be underground canal tours, however. The story I wrote about above suggested that the canals up in the modern city itself would be revamped.